Zach Whalen is Assistant Professor in the English, Linguistics and Communication Department at the University of Mary Washington, where he teaches courses in video games, the graphic novel, media studies, and electronic literature. He is co-editor (with Laurie Taylor) of Playing the Past: History and Nostalgia in Video Games. I am a fan of Zotero, an open source bibliographic tool created by the Center for History and New Media at George Mason University. I use Zotero nearly every day when I prepare for classes or do my research, and I always introduce it to my classes as early as possible in the semester so they can start using and benefiting from it. 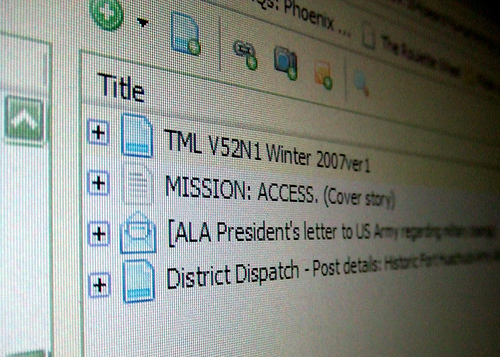 I’ve also used Zotero for assignments, and recently, I’ve started thinking even broader, to treat Zotero as an archival tool, to take Zotero, in other words, beyond the typical workflow (collect -> organize -> export) into something else — ideally, something that adds the all-important functions of dissemination and discovery. I don’t think I’m there yet, but I’ve had some experience creating assignments with Zotero, including a recent and hopefully interesting setback. In this blog entry, I want to talk about the steps I’ve taken so far, as well as some obstacles I’ve met, including a few I’ve overcome. Mainly, I want to invite others who may have had similar experiences to comment on how you’ve worked with this tool or used it in the classroom. I’ve searched on TECHstyle and haven’t found any mentions of Zotero, so maybe a brief introduction is in order. Basically, Zotero is a research tool that plugs in to your FireFox browser (Note: Zotero Everywhere is coming soon, which will put it into multiple browsers.) There’s a nice video on the Zotero website introducing most of the basic uses of it, so I won’t rehash those here. For my part, I find myself most often using it to 1) collect bibliographic data on items I find interesting, 2) adding notes to items when I read to prepare for class, and 3) storing PDFs of certain works that I plan to read later — say, outside my campus network. Annotating. Adding notes to Zotero is easy, and the search feature makes it makes it easy to find your notes later. I use these for class prep, mainly, since the context of a specific artifact is centered to the Zotero collection in which I store the bibliographic data and document that I will be sending my students to read. Synchronizing. This is the main thing, without which, Zotero would be pretty much useless to me. (I say that, even though I’ve been using Zotero since before this was actually available.) 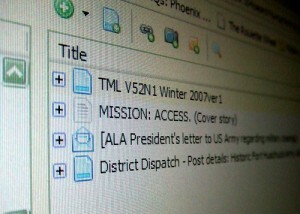 Whatever changes I make to my library while at school — adding items, adding notes, rearranging collections — will also be reflected in the copy of Zotero running on my computer home, as well as the public version of my library. For example, I occasionally read journals articles that are locked behind a paywall. So if my school has access to a specific journal I want to read, I would normally have to use a VPN to access my campus network before looking at that article anywhere else. This isn’t a big deal, but it’s more convenient to pull up a snapshot in Zotero. Why use Zotero for an assignment? I’ve been teaching a full load of courses for going on three years now, and I feel like I’m still trying to get the hang of real course design: that is, connecting learning objectives or outcomes to specific assignments. I have to constantly remind myself that a stated objective like, “Upon completing this course, a successful student will X,” imples a course structure where a grade (success) actually depends on X. This, I’ve learned, is often harder than it seems, and I don’t think I’m very good at it yet. That said, I think Zotero can be quite useful for accomplishing, either directly or indirectly, the kinds of objectives I do manage to articulate. In one of my current courses, World Building, for example, I include the optimistically vague objective that defines X as “gain experience using New Media tools.” This could mean a lot of things, but it gives me a justification to use things like Zotero. I definitely believe that using Zotero will make my students’ lives easier, but they don’t always believe me when I tell them that. Moreover, my teaching area is New Media Studies, and I can point to Zotero as a simple example of a value-added outcome related to New Media technology. Above all, Zotero is the kind of easy to use tool that gets students who are otherwise tech-phobic to use some technology that makes a clear impact on their life as a student. At least, it has that potential, and the kind of reflection it invites on both the research workflow and use of software to solve problems is definitely a good thing. Finally, Zotero is open source, so even if they’re already familiar with a competitor like EndNote, students get to consider and weight the benefits of an open source alternative. Finally, one of the things I like a lot about Zotero is its easy to use group functionality. This is actually where I’ve had the most success building assignments, since students can work collaboratively to produce and share annotated bibliographies. Still, this process is not without it’s hiccups, which leads me to some of the challenges I’ve faced. Zotero stores library data inside of your FireFox profile directory, which is a bit of a problem, I’ve learned, when working in a computer lab that uses a generic log in, like the one I teach in every day. Essentially, the risk arises that one student’s library could become blended with another’s, which would cause all kinds of problems both for organizational integrity and for my later evaluating who added what. Therefore, I’ve had to instruct students not to install or use Zotero on their lab computers. This is a challenge, pedagogically, because it delays the “aha” moment of using Zotero until a student actually gets around to using it on her laptop, if she ever does. The majority of my students do bring their own laptops to class, which mitigates this somewhat, but the tradeoff there is often that student’s computers will be sufficiently different from the process I demonstrate on the lab computer that they will abort the process before they actually complete it. One of the coolest features of Zotero is the ease with which it allows students to work in groups. This is a slightly more advanced feature, and it turns out that students who haven’t yet gotten used to the basic, individual use of the software have a harder time understanding the steps that are needed to make the group functionality work. Beyond this, I’ve encountered bugs or unexpected behavior in the group synchronization process, and even though my students are mostly Zotero-novices at best, I have hard time separating user-error from actual bugs. Still, the benefits typically outweigh the consequences. Finally, the most recent assignment I’ve created using Zotero has actually come to a standstill, I’m sorry to say. As I mentioned earlier, Zotero is great at collecting things, but not very good at sharing them. Fortunately, CHNM has also produced Omeka, which does a very good job of building a website around a collection of items, say, in a special collection at a museum. In fact, I often say that if Zotero is your library, Omeka is your museum, so the idea that the two should talk to each other makes a lot of sense. There is, in fact, a Zotero Importer plugin for Omeka which proposes to do just that. So when I planned my assignments this semester for my World Building class, which includes a unit on Alternate Reality Games, I thought I had found the perfect work flow for building a transmedia archive. That is, much of the content that comprises an ARG is inherently ephemeral or at best temporary, leaving many significant ARG texts practically unavailable for ARG scholars to study. So I designed an assignment to do something about that. The idea was for students to find a currently “live” ARG, and use Zotero to collect, contextualize, and (most importantly) store copies of all available and relevant artifacts. This part worked pretty well — students worked in groups and produced pretty good repositories of data. However, when it came time to prepare the second part of the assignment (transferring these repositories into Omeka and building them into web-based exhibits or narratives of these ARGs), I discovered that the previously functional Zotero Importer plugin no longer worked. The problem, it turns out, has to do with some changes and bugs in the Zotero API. So obviously, I have a problem. Now, all this is open source software, so I did spend some time poking around under the various hoods involved, but even though I made some progress, I ultimately hit a dead end. Communicating with the key developers revealed that the depth of the problems are way out of my league as an amateur coder. Of course, this is always a risk with open source software, but it really came at the worst possible time as far as this assignment is concerned. At this point, my assignment is pretty much on hold. I’ll figure out a way to salvage credit for my students, but it’s disappointing because the real power here for narrativizing an archive won’t be realized. To conclude: I like Zotero and I use it a lot. Many of my students also use Zotero and make it a regular part of their research live, especially the nifty Word Processor plugins. I’ve built assignments where students created annotated bibliographies in Zotero, and a recent assignment used it to collect and archive transmedia artifacts, before running into a dead-end when it came to transferring those collections out to Omeka. So have you used Zotero for an assignment? Can you envision uses beyond what I’ve discussed here? How have you encountered and dealt with software problems that lead to assignments having to be revised or even aborted? Tagged archives, omeka, open source, pedagogy, zotero. « YouTube in the Classroom: A Frustrating Archive? Great post. I’ve never used Zotero in the classroom before, but I think I might in the spring. I’m planning on having my students do a collaborative research project where I want them to share their research with one another. The idea is to crowdsource the research for the project, so different groups can use each other’s research down the line. I’m a little new to Zotero groups, so I would love to know how well Zotero would manage this sort of thing. You’ve said that the group feature is “slightly more advanced.” What problems have students running the group feature run into? Well, mainly, it’s just little things like, if they haven’t gotten used to the idea that their left Zotero pane includes collections and sub-collections, it’s hard for me to explain that by joining a group and syncing their account, they’ll have additional libraries with their own collections and sub-collections. There’s just a few extra explaining steps. I’ve also seen issues with permissions being set on groups. You can set a group to public or private, and you can also decide to let group members or only admins edit the contents. Additionally, you can decide to let group members or only admins edit files. That seems pretty straightforward, but I found some non-obvious behavior when it comes to “Snapshots”, because Zotero doesn’t actually think of these as “files,” it turns out. So the idea is, if you want to share a snapshot in a group, you’re also supposed to set it to “Private,” and even then, I’m not sure that it actually works as advertised. Fantastic post! I have begun using Zotero this term, primarily for a major collaborative midterm project where I had students tracking the Jon Stewart Rally to Restore Sanity. I wanted them to pay attention to the resources they were using – not only for articles, but for videos and images as well. By using Zotero they captured the information they needed, and it was waiting for them when they went back to create their poster assignments. They also shared these artifacts across a group I had set up for this purpose. Overall, I saw a significant improvement in how the students documented and cited their sources, although many of them needed prodding to fill in certain bibliographical spaces in the citation panel. I don’t quite know how to overcome this particular issue, and I wonder if you use a particular approach when first introducing Zotero that might reinforce the need for students to do more than click and move on. I definitely intend to use Zotero in the Spring term, and hopefully in a more robust fashion now that I have a better understanding of its capabilities. Thanks Diane! Glad to hear it’s working for you as well, and capturing the rally is a great idea. That’s actually pretty close to my use of it for transmedia artifacts, where the key is for Zotero to capture things on the fly, then reconstruct the narrative later. I’ve seen that as well, where students don’t go through each of the fields, and I’m afraid I don’t have any secret solution to it. I just stress the importance of preserving context for these real-time archives, and I point out that grabbing a snapshot doesn’t really preserve any of that context. So they’re doing themselves a favor if they organize and tag their collections well, and also make use of as many bibliographic fields as possible. Anyway, sounds like a great assignment. Are your students’ posters available online anywhere? Thanks for the great ideas, Zach. I spent a good 30 minutes today expounding on the importance of keeping track of one’s sources and properly documenting them in a specific format. My students are working on collaborative websites, so sharing resources across Zotero would work really well in this scenario. I might redesign the assignment for next semester to include it. How do you evaluate your students’ use of Zotero – is it factored into their grade on the assignment? Sometimes, it is factored in. It was going to be an integral part of the now-aborted assignment, for example. In the case of an annotated bibliography, however, I had students export their biblios with notes to post them on a class website. So technically, they could have done that without Zotero at all. One issue I’ve run into (and I’ve seen others hit this as well) is that when you view a group library inside of Zotero, it’s not immediately obvious what user added a particular item or note. You can view it within the web version of the collection, but it takes two clicks per item. It’s tedious, in other words, to keep track of which student has really done the work. It makes sense, though, to evaluate Zotero use as part of the assignment. That would help it work more tightly with the course outcomes in relation to the assignment sequences, for example. I’ll definitely think more about this for my next Zotero assignments!